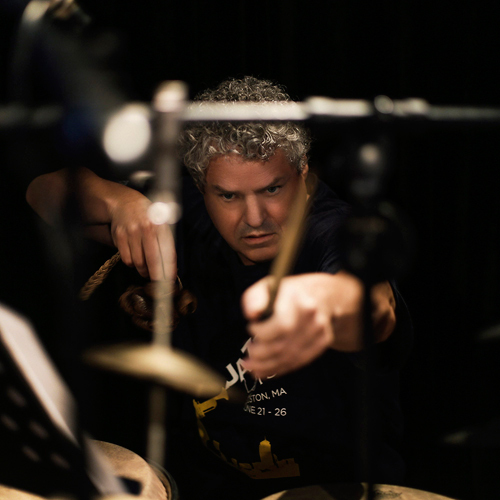 Jerry Leake is an Associate Professor of Percussion at Berklee College of Music where he teaches several classes on World Percussion, and a Survey of African and Afro-Cuban styles for members of the prestigious Berklee Global Jazz Institute directed by Danilo Perez and Marco Pignataro. At Berklee Jerry also teaches private lessons on Drum Set (with an emphasis on adapting world rhythms), North Indian Tabla, Afro-Cuban Congas, Vibraphone, and World Rhythm Theory using his "Harmonic Time" method. View his TED talk on Harmonic Time. Jerry is also a longtime faculty member of the New England Conservatory of Music where he is a member of both the Jazz Department (directed by Ken Schaphorst) and the Contemporary Improvisation Department (directed by Hankus Netsky). At NEC Jerry teaches classes on "Development of Rhythm Skills," "Survey of African Music and Dance," and "World Percussion." He also leads the African Drumming Ensemble, and teaches privates lesson on Drum Set, African and Indian Percussion, and World Rhythm Theory. Jerry has been a guest lecturer in Caracas Venezuela (for the El Sistema program, 2010), in Panama for the Berklee Global Jazz Institute (2014, 2015), and for the Panama percussion festivals directed by Danilo Perez. Jerry has given lectures at the University of Wisconsin, University of Southern Maine, Gordon College, Salem State College, Boston University, University of Amherst, North Hampton College, Dartmouth University, MIT, Harvard University, Holy Cross College, Boston College, Bowdoin College, ME; Emerson College, master class with Bob Becker (NEC), ongoing lectures at Boston University with Peter Row; Wellesely College in tabla and kathak dance accompaniment with Gretchen Hayden. In Chennai, India at Sri Jaya Ganesh Tala Vadya Vidyalaya School of Karnatak music; Kalekshetra Dance Foundation; two-day workshop and performance (sponsored by the U.S. Consulate) with the National Folklore Support Center and the Tamil theatre group "Koothu-p-Pattarai." Program included live 2-hour radio performance of solo percussion. Jerry also teaches private lessons to all ages out of his home and is available to receive new students at any proficiency level.